The thing is, Rozier’s not that short — he’s listed on Boston’s roster at 6 feet 2 inches. He’s too tall to join the exclusive fraternity of NBA players whose skills were likely questioned as they pursued a career in pro basketball because they were vertically challenged. In 1995, rapper Skee-Lo, who is 5 feet 9 inches himself, provided the anthem for this mold of hopeful hoopers on his hit single, “I Wish”: I wish I was a little bit taller / I wish I was a baller. There’s even a bit of a new remix. Height, however, didn’t stop the following NBA players from balling out. In order of ascending height, these are the top six stars in league history who stand at 6 feet tall and under. Muggsy Bogues (right) of the Charlotte Hornets drives to the basket against Charles Oakley (center) of the New York Knicks in Game 1 of the Eastern Conference quarterfinals during the 1997 NBA playoffs at Madison Square Garden on April 24, 1997, in New York. Tyrone “Muggsy” Bogues, the No. 12 overall pick out of Wake Forest in the 1987 draft, is the shortest player to grace the hardwood in the NBA. During his 14-year career with four teams, cameras often depicted the height difference between the 5-foot-3-inch Bogues and his taller counterparts. There’s the 1987 photo of him standing next to his 7-foot-7-inch Washington Bullets teammate Manute Bol. 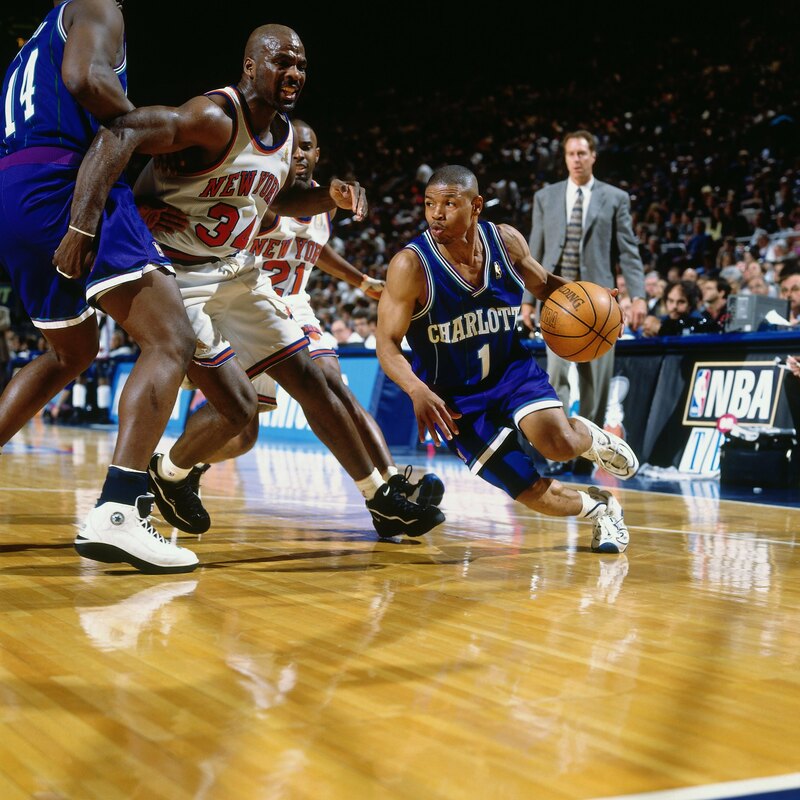 And, from the 1995 playoff matchup between the Charlotte Hornets and Chicago Bulls, there’s a shot of Bogues crouched in his defensive stance guarding the 6-foot-6-inch Michael Jordan. During that series, the greatest of all time allegedly poked fun at the small point guard, saying, “Shoot it, you f—ing midget” — although some have dispelled the story as a myth. Bogues is one of the best players in the history of the Jordan-owned Hornets franchise, as Charlotte’s all-time leader in minutes played, assists and steals. 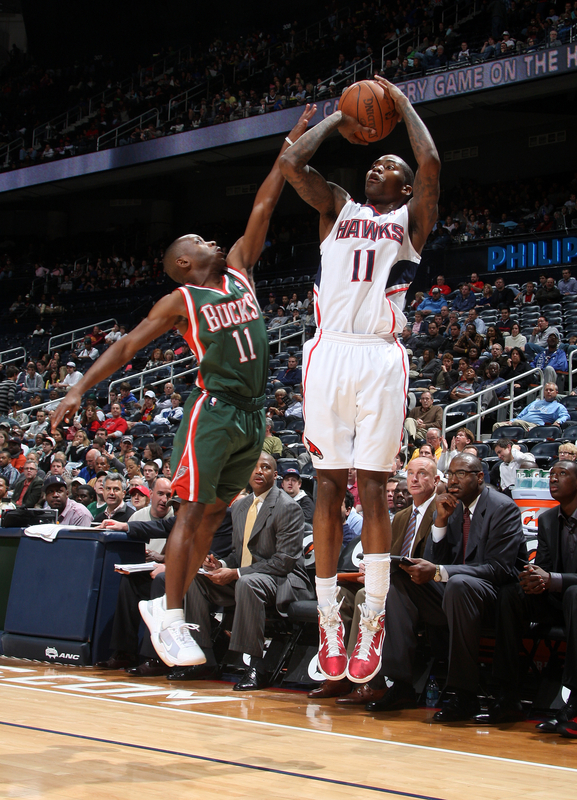 Jamal Crawford (left) of the Atlanta Hawks shoots against Earl Boykins (right) of the Milwaukee Bucks on March 15, 2011, at Philips Arena in Atlanta. In a game between the Denver Nuggets and Detroit Pistons on Nov. 11, 2004, Earl Boykins, at 5 feet 5 inches, became the shortest player in NBA history to drop 30 points in a game. Boykins put up 32 for Denver despite dislocating the middle finger of a hand in the first quarter. Out of his 16 seasons in the NBA, the 2006-07 campaign, during which he posted a career-high average of 15.2 points in 31 games, stands out the most. Boykins established a reputation on scouting reports as a scoring threat that year, putting up 20 or more points in all but one contest during a stretch of 10 games (coming off the bench in most of them). Even more impressive: Checking in at 135 pounds, he could bench-press 315 — nearly 2.5 times his weight. In the 1986 NBA Slam Dunk contest, Anthony “Spud” Webb slayed the 6-foot-8-inch, high-flying giant Dominique Wilkins — his Atlanta Hawks teammate and the champion of the 1985 competition. Then a rookie, Webb also beat out Terence Stansbury, Gerald Wilkins, Jerome Kersey, Paul Pressey, Roy Hinson and Terry Tyler. And with two perfect scores of 50 in the final round, he put the nail in the coffin against the man who had outdunked Jordan the year before. No player shorter than Webb has ever participated in the contest — or emerged as the winner. Little guys can fly too. 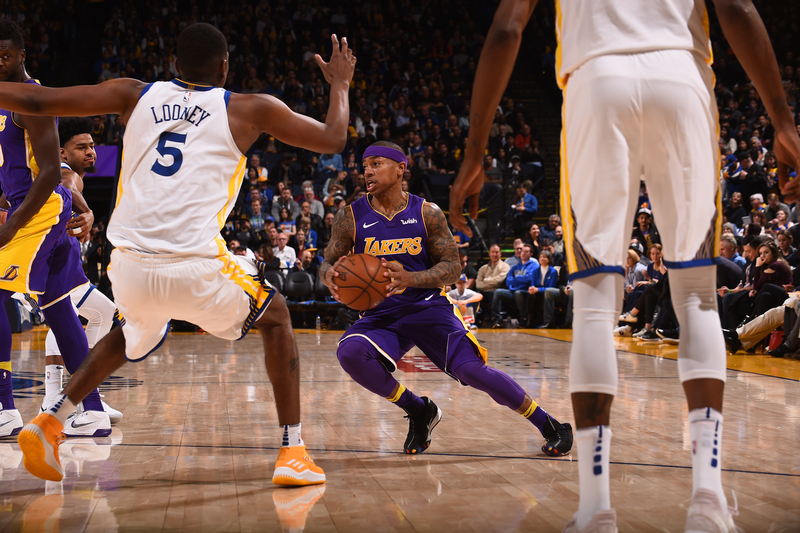 Isaiah Thomas (center) of the Los Angeles Lakers handles the ball during the game against the Golden State Warriors on March 14 at Oracle Arena in Oakland, California. Is John Wall more athletic than Russell Westbrook? For his entire pro career, which witnessed him go from the last pick in the 2011 draft to one of the NBA’s most prolific scorers, Isaiah Thomas had either been classified at 5 feet 9 inches or 5 feet 10 inches. But those marks are a little generous. So in 2016, while playing for the Boston Celtics, Thomas came clean. “I’m only 5-foot-8,” he wrote in The Players’ Tribune. His current squad, the Los Angeles Lakers, lists Thomas at 5 feet 9 inches on its roster — despite his confession. Regardless of how tall he actually is, Thomas represents a dying breed in the NBA: little guys with huge games. He came up especially big on May 2, 2017, with a career-high 53 points on what would’ve been the 23rd birthday of his late younger sister, Chyna, who died in a car accident at the beginning of last year’s playoffs. Thomas’ performance marked the highest playoff scoring output since another undersized player, Allen Iverson, dropped 55 in 2003. Only one player in the history of the NBA Slam Dunk contest has been named champion three times. That claim belongs to the one and only Nate Robinson, who won in 2006, 2009 and 2010. During the ’06 contest, he brought Spud Webb onto the court and threw down a jam after flying over him to earn a 50. An NBA journeyman, Robinson played for eight teams in 11 seasons while showing off his leaping ability every chance he got. In practice, he dunked on the 7-foot-1-inch Shaquille O’Neal, and in a game he blocked the 7-foot-6-inch Yao Ming. He hasn’t played in an NBA game since 2015, but you’ll see him on a big-screen court this summer in the hoops flick Uncle Drew. Hope his character, Boots, will catch a body for old times’ sake. Robinson definitely still has that bounce. 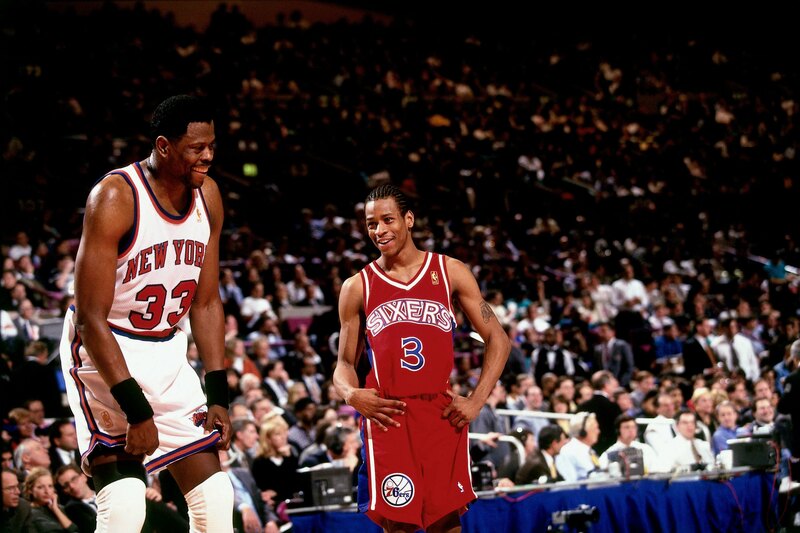 Allen Iverson (right) of the Philadelphia 76ers matches up against Patrick Ewing (left) of the New York Knicks during a 1997 NBA game played at Madison Square Garden in New York. It was once one of the most pondered questions in all of basketball: Is Allen Iverson really even 6 feet tall? “There’s no way,” Spurs forward Malik Rose told The New York Times in 2003. “He’s like, 5-11.” There’s no question that Iverson’s height is the least important number in his career. Four league scoring titles, 11 All-Star selections, three first-team All-NBA selections, one MVP Award and more all make the Hall of Famer the greatest pound-for-pound — and inch-for-inch — player of all time. Honorable mention: At 5-foot-9, Calvin Murphy is the shortest player to be inducted into the Naismith Memorial Basketball Hall of Fame (1993). Murphy (1979) and Isaiah Thomas (2016, 2017) are the shortest players to appear in the NBA All-Star Game.